In this assignment we'll add functionality to our PlayerController C# script to allow our player to pick up collectable objects when bumping into them. Player game object and the Pickup game objects. we could collect the wrong objects by accident. We could collect the walls for example. First we need to reactivate our Player. to make the player visible once more in the scene. object is active or not. code are we going to write? documentation using the hot key combination. details of our Player game object. and the type of component. component reference in the Unity manual. component in the context of the editor. script to this component's class. for the circle collider 2D. collected it and fell back to the ground. but that's okay, we can change it. Next let's look at this code. We're using the function OnTriggerEnter2D. This is the 2D collider called Other. a hold of the 2D colliders that we touch. to make the Player move slowly, for instance. we'll use this to do something different. our Pickup object via a script. two lines containing the characterInQuicksand variable. Well, what clues do we have? we want to deactivate that game object. The second is Set Active. a game object through code. each in their own tab. Tags And Layers panel before using them. we can use this tag in our code. tag is being set to Player. paste it in to our working pallet. the Name field in the inspector. to deactivate our Pickup game objects. to our pallet as well. This code will work without braces. associated with the If statement. conditions in the If statement are met. making sure that the code is properly indented. no meaning to the compiler. this block of code in later lessons. which will deactivate that game object. Tag List at the top of the inspector. as part of the project. This opens the Tags And Layers panel. Now let's test our game. Just like we are with the walls. So let's exit play mode. brief discussion about Unity's physics system. and selecting the game objects. and property values of the selected game objects. and the selected pickup with a single click. areas for these two objects. 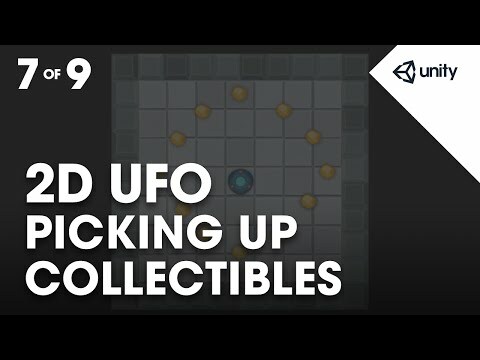 in Unity's 2D physics engine? or other parts of the scenery. be affected by the collision. But the dynamic objects will be. or overlap of 2D collider areas. It doesn't cause a collision. 'you have discovered this room'. because the player has walked through a trigger. see the lessons linked below. 2D areas in to trigger areas. and look at the circle collider 2D component. and highlight the Pickup prefab. we see a property called Is Trigger. Let's set this to True. Now let's enter play mode and test. Excellent, let's exit play mode. So far everything looks great. But we have one issue. non-moving objects will have to be recalculated. is expected to be static. Let's enter play mode and test. As we can see, our Pickups fall off the screen. don't collide with the walls. This is only a partial solution however. That is to select Is Kinematic. to be a kinematic 2D rigidbody. Let's save our scene and enter play mode to test. but should have a rigidbody2D attached. Player are moved using 2D physics forces.